Bragg Construction and Remodeling provides Professional Carpenters and Craftsmen. We have been a family owned business for over thirty years. 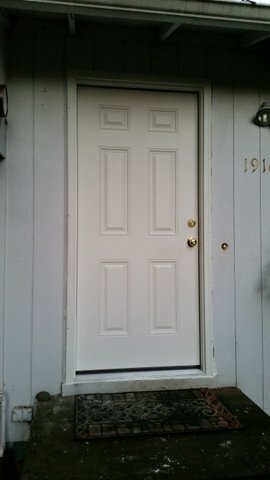 We have completed hundreds of door installations in the Portland area. We service Gladstone to Portland. 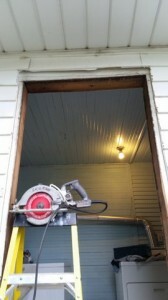 The door opening shown here needed several modifications. These modifications, while complex, are well within the skill set of a Master Carpenter. Here is a picture of the old door. 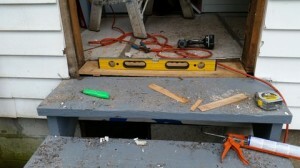 After the old door is set aside work begins on leveling the sill so that the door can sit on a solid base. framing and a piece of cedar are glued, shimmed and screwed to the framing. A unique trim application was planned to accommodate the wacky framing of this old house. 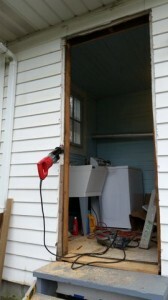 The next 3 photos show all the various cutting that had to happen to fit the new door to this old house. 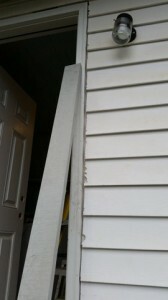 The vinyl siding was cut back so that the exterior trim would set flush. The old sub siding was cut back and the header trimmed to make way for the taller door. 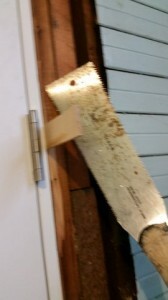 The framing on the side of the opening had to be shaved the length of the stud so that the opening would be wide enough for the new door. There is a reason Carpenters are sometimes called wood butchers. The door was hung, “plumb, level and square,” key to any proper door installation. 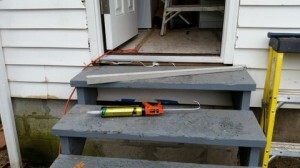 Stainless steel screws, nails, glue, caulk and shims are all used to insure that the door is solid and weather tight. The excess shims are trimmed. A custom tapered sill support is cut, fitted, caulked and nailed. The next 3 pictures show the factory trim flush to the vinyl siding. A creative remedy to this is to add a 1×4 flat casing with a nice looking reveal. 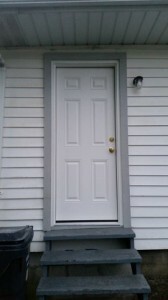 This trim covers the vinyl, fits nicely to the factory trim and completes the weather tight seal of the door. 1 x 3 flat trim is added to the inside. Brand new hardware is installed. The site is cleaned, and the old door recycled for garden art. Another happy customer. 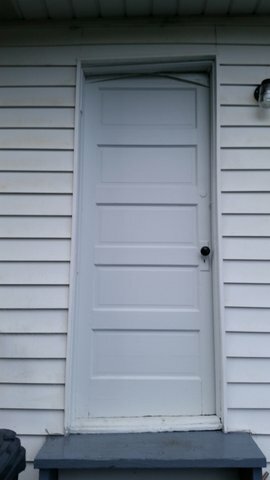 This old house with a brand new perfect door. This is a before picture of an exterior front door replacement that is well underway. This project was completed at a home in Oregon City, Oregon. First, accurate Measuring and Ordering. Please let your professional Carpenter do the measuring and Ordering. 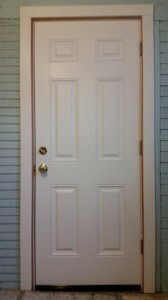 You should be involved in the choice of your door but take recommendations from your Carpenter. Choose a door with a good balance of beauty, function, quality and cost. When choosing your door be sure to decide who is going to pick up and deliver the door. Once again We recommend that you let the professionals do this. If you damage your door we will cry for you but you will be responsible for the cost and time delays. This is the after picture of the exterior front door. This was a relatively simple install because there were no changes to the framing. 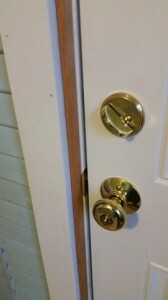 We also recommend new hardware when change a door because the door will function and look good. We have the right Truck to keep your door safe and warm. 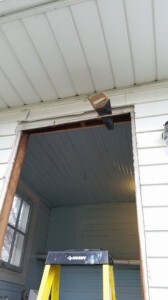 After we Pick up and deliver the undamaged door we remove the trim around the old door. We double check again that the new door will fit before we remove the old door. Next we remove the old door and set it safely aside. We Verify and level the sil as needed. We Install the new door. “Plumb, level and square” is the saying of a Professional Carpenter. Sometimes the door opening has to be modified. 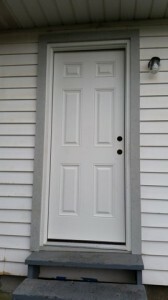 My next blog post will show a door install that needed several modifications. The door is “hung” plumb, (that means straight vertically) and level (horizontal). The door gets secured with screws, nails, and shims. 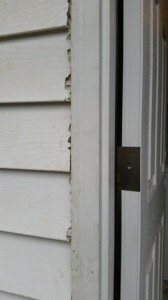 Foam weatherstripping fills the gaps between the door jamb and the framing of the house. Interior and exterior trim are applied, hardware installed and touch up painting applied as needed. 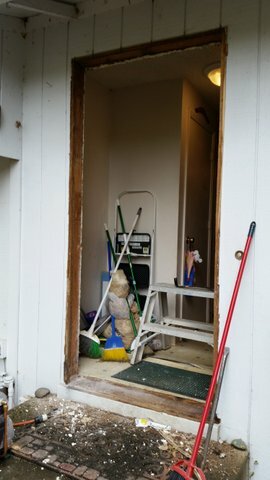 We clean up our debris and dispose of the old door and other trash.